A December 2010 FBI counter-terrorism report said that “the Muslims of the Americas terrorist organization” has communes in Virginia. There is evidence of additional compounds. Law enforcement sources told the Washington Times in 2002 that both compounds had 200-300 residents and “have been linked to various money-laundering operations and weapons violations, and are believed to have aided and abetted various terrorist groups.” They said it was not clear where the funding for the compounds come from beyond a small number of members with regular jobs. In 2000, Fuqra/MOA terrorist James D. Williams was arrested in Lynchburg, which is near the Red House compound. He was missing since 1993 and was the leader of the Colorado branch. Law enforcement believed he was involved in insurance scams and other fraud along the east coast. He hid under various identities including that of Keith Bell, another Red House resident. Evidence from another prosecution indicated Bell was involved in weapons acquisitions. Bell is a NRA-certified pistol instructor. When the police sought to apprehend Upshur, the “mayor” of the compound warned the local sheriff that any approach would be met with violent resistance by an estimated 200 armed members visiting from all over the east coast. He explicitly said they were waiting and ready to defend her. Pierre said during the trial that “our religious community encouraged its members, who are not prohibited persons, to take advantage of their 2nd Amendment rights as American citizens.” He said that the majority of residents were armed by the late 1990s. In December 2001, another Red House resident, Bilal Abdullah Ben Benu, was arrested for illegally buying guns. He was previously convicted in 1992 for lying about his conviction for possession of crack cocaine in Maryland. Ben Benu had a SKS assault rifle, 9 mm pistol and AK-47 ammunition. The compound was reportedly under surveillance before the September 11, 2001 terrorist attacks because of suspected weapons stockpiling. It was reported in 2002 that law enforcement suspected the frequent movement of members in and out of the compound was for the purpose of setting up safe-houses in rural parts of southern Virginia. In February 2003, a female MOA member was indicted for illegally purchased several weapons for the group. The NCIS was concerned that MOA would target a U.S. Navy contractor in Lynchburg named BWXT Technologies that is the sole provider of nuclear fuel power units for the naval reactors. The FBI liaison did not believe MOA posed a threat to the facility and that members in the area would limit their activity to crime like fraud and illegal gun purchases. Documents from the investigation obtained by Ryan Mauro of the Clarion Project reveal that a source said that after a hurricane in September 2003, the Red House leaders would not allow Virginia Power to come onto the property to fix power lines and denied access to the local fire department. Access was only granted and power restored several days later. The files do not indicate what MOA used that delay for. The source reported that a new MOA member arrived in late 2003 from the New England area wearing expensive clothes. He said “the people down here were not taking care of business and they were not taking the situation seriously.” The blaring of daily prayers through speakers then stopped. It is very possible that MOA had advance knowledge as the neighbors suspected. The FBI said at a Joint Terrorism Task Force meeting on August 4, 2003 that a local police officer from the Orange City Police Department had been put in charge of security for the Red House compound. MOA has historically tried to infiltrate local law enforcement and members have indeed been hired on some occasions. The files also state that two families left the Red House compound because the rules became too strict and television was banned. A witness also saw several Arabic-speaking Muslims who appeared to be Middle Eastern in the area and one covered his face when the witness took a look at him. A local controversy erupted in 2007 when the compound renamed its street as “Sheikh Gilani” in honor of their radical leader based in Pakistan. Its “mayor” is Matthew Gardner, also known as Muhammad Ali Qadri. Gardner is one of the main spokespersons for MOA. A former member of MOA for nine years said that Gardner spent about five years in Pakistan. Gardner was born in Europe and says that he was in the U.S. Air Force for five years. Afterwards, he fell back into drug abuse and converted to Islam after being a Quran by a Muslim friend. He met MOA shortly thereafter. Five years later, he went to Pakistan to meet Sheikh Gilani. He saw miracles when spending time in the mountains with Gilani and at a boys’ hostel at a college in Islamabad. Gardner spoke at an event on April 26, 2011 in Owego, New York that was held by MOA’s interfaith front, the United Muslim Christian Forum. He preached that the U.S. will be destroyed by Allah because it did not prohibit the burning of a Quran by extremist Pastor Terry Jones. A member of the compound told reporter Catherine Herridge in 2007 that the compound has residents from Europe, Puerto Rico and Mexico. Meherrin, VA is the location of a 25-acre compound. It was never publicly disclosed until it was found by bloggers in 2005. A company named White Hawk Security International was found to be based at the site in 2005. The company says it is for private security and consulting, security guards and patrol services and detective and armored car services. A business database listed it as having 50 employees and annual sales of $20 million. The company and its officials are linked to various other companies, including ones involved in similar security duties. A historical pattern in Fuqra/MOA operations is establishing security companies as fronts, although this business has not been publicly accused of illegal activity. White Hawks are also significant in MOA’s ideology. A 2011 issue of the MOA’s newspaper, the Islamic Post, states that White Hawk Security International has an office in Caroni, Trinidad. It says that the company specializes in private investigation, debt collection, executive airport retrieval, 24-hour monitoring and response, confidential reviews, personal bodyguards, security and safety consultation, audits and risk assessments and licensed bailiffs. The newspaper was obtained by Ryan Mauro of the Clarion Project. MOA is known to have a presence in Trinidad and has been linked to the Jamaat ul-Muslimeen group there. Three of the Fuqra/MOA terrorists involved in a major bomb plot targeting Toronto in 1991 were deported there in 2006. A law enforcement source says that one of the deportees, Barry Adams, is linked to the White Hawk Security office in Trinidad. His son, Hussain Adams, is chief executive of MOA and lives at the Islamberg headquarters in New York. A 2004 report funded by the Justice Department identifies Falls Church as having had a “training compound” for MOA. An online directory of MOA “Dawah Centers” – that has proven accurate in the past – identifies a MOA Da’wah Center in Roanoke. A 2004 report funded by the Justice Department identifies Red House and Falls Church as the locations of “training compounds” for MOA. An ATF Special Agent said in 2001 that he knew for a fact that one Red House resident had visited Pakistan and there was credible information from an informant that one resident furthered his training by going to Afghanistan. Fuqra/MOA terrorist Edward Flinton, who was caught hiding near the Islamville compound in South Carolina, said that a MOA operative going by the name of “Doorsman” instructed paramilitary classes in Norfolk. An applicant for Sheikh Gilani’s “Soldiers of Allah” guerilla warfare/jihad force who lived in Williamsport, Pennsylvania, said he got a “basic demolition course” from “M.J.” in Virginia in 1983. He said he had a refresher course in 1990. The application was seized during the 1992 raids on MOA sites in Colorado and Pennsylvania. A former MOA member of six years who lived at “Ahmadabad West” told reporter Catherine Herridge in 2007 that members own legal weapons but have minimized any target practice inside the compound because of the public scrutiny. The former member said it is only done on at certain times and they now use public ranges and don’t wear Islamic clothing in order to avoid detection. Ali Abdel-Aziz, a former MOA member who served as an informant for the NYPD for 8 years, gave similar information. He said that he joined a “formed military squad” that took classes at a facility outside of the Red House compound. The report says that many MOA members are alleged to have served in the U.S. military. An intelligence source with direct experience investigating Fuqra in Virginia described the group as highly dangerous and well-armed with legal weapons. He described their tactical training, some of which took place inside Red House at the time, was “very good.” He said it is believed that members strategically choose places of employment in order to develop expertise in needed areas. Other DEA documents from 2004-2005 state that a MOA member in Virginia believed to be involved in drug trafficking has a “business interest” in about a dozen companies in Philadelphia. Another three companies in Virginia Beach are also listed. The files indicated that multiple members were involved in the trafficking. At least one of the suspects was seen at the Red House compound. The heavily-redacted documents show that the DEA believed there was a connection between Al-Qaeda and MOA activity in Virginia. The name of Osama Bin Laden is mentioned three times and it is indexed under the Bin Laden category. Another set of DEA documents from October 2004 refer to an investigation of cocaine trafficking between MOA members in Red House, VA and Dover, DE. It says that Dover POD “has linked several Muslims to a Mexican cocaine trafficking group. [Redacted] is a member of the MUSLIMS of AMERICA.” The suspect was associated with 4 U Transportation, a “company suspected of transporting cocaine” based in Dover. The documents state that MOA members have been seen near the Red House camp in vehicles registered to the company. According to the documents, the ATF, FBI and DEA identified this suspect as having a leadership role within MOA. The suspect was seen with three Muslims at an address used by several MOA members. The investigators expressed concern about the proximity of the Red House compound to a critical naval reactor’s command contractor. Evidence linked MOA members suspected of involvement in the charter school scam in California to Virginia and Red House specifically. Several phone calls were made to Virginia and there was significant mail traffic between the MOA community in Victorville, California and Red House. Separate law enforcement sources in Virginia and Georgia have spoken of a pattern of suspected check fraud involving MOA members from Commerce, Georgia who temporarily stay in Virginia and meet with members linked to the camps. A September 2003 NCIS report discusses suspicious activity at convenience stores in the Red House area that are thought to be tied to MOA. Purchases of stores in Brookneal, Gladys and Rustburg were mentioned, as well as the purchase of a store in Charlotte Court House by an Iraqi. A 2009 Virginia State Police Fusion Center report confirms that the MOA in Virginia has been involved in drug trafficking, fraud, surveillance and counter-surveillance, sale of counterfeited items and attempted government infiltration. MOA-owned businesses and charities are used to fundraise for Sheikh Gilani in Pakistan. The report says that “intelligence gaps make it impossible to assess the level of criminal activity” of MOA in the state. Sheikh Gilani and MOA leaders usually respond to arrests of members by claiming they were previously expelled from the organization. “We have had many, many members or ex-members that have been removed because of their history of crime. With any organization with a large amount of people, you’re going to have people that are just bad apples,” said Matthew Gardner, the “mayor” of the Red House compound. In 2007, eight people were arrested in Virginia including several clearly linked to MOA. They were part of a massive scheme to sell counterfeit clothing and movies. The ring raised $19 million in proceeds from December 2004 to September 2006. There were unconfirmed reports in 2002 that law enforcement suspected that one or both of the “Beltway Snipers,” John Allen Muhammad (originally John Allen Williams) and Lee Boyd Malvo, had links to “Ahmadabad West” in Red House and may have even hid there. One blogger who closely followed the issue pointed out that the Meherrin location, which was secret at the time, was a much stronger candidate as a potential hiding spot. One MOA-affiliated source recalled hearing conversations about members having previously met John Allen Muhammad in the northeast and that he had visited one of the compounds in Virginia. The source said he did not live at the compound and was not related to James D. Williams. The pair killed 10 people and injured three. MOA began negotiating the purchase of 100 acres of land in Campbell County in 2002. MOA members moved into the area. The Virginia compounds were thought to be preparing for the arrival of members from California who had abandoned the “Baladullah” 400-acre compound after a top leader was arrested for running a charter school scam that defrauded the state government of over $3 million. An April 2004 report from the Naval Criminal Investigative Service states that an identity-protected witness said that a MOA computer engineer from Philadelphia had arrived and purchased 124 acres of land near the Red House compound. The individual is said to work out of Farmville. The file says that heavy construction is taking place at the site but the purpose is not known. Another new arrival is said to live on 35 acres of land with his family that he purchased even though he seems to be unemployed. He leaves the area frequently and the witness says there are conflicting reports about the purpose of this trip, with some suspecting he is an informant for the government. The source reports that rifle fire is heard from his property. The NCIS files said that MOA is expanding into Lynchburg, Meherrin and southern Campbell County near Rustburg. MOA documents from 2005 that were obtained by the Clarion Project’s Ryan Mauro show that a MOA entity named the Islamic Naat Group LLC is registered to PO Box 92 at Red House, V.A. It is an Islamic singing group. 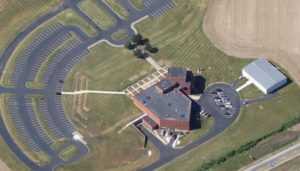 A Naval Criminal Investigative Service (NCIS) report from an investigation into MOA says that a witness provided information about a meeting at a venue known as the “Islamic College” in Randolph, Virginia in 2004. The witness reported 100-150 attendees arriving in cars from New York, Michigan and Maryland. An online blogger wrote about a place called the “Muslim Teachers College” at this location led by an Imam Qadir Abdus-Sabur in 2005 but felt there was insufficient evidence to link it to MOA. It is located between the Red House and Meherrin compound locations. At the time, the sign for the college was on the ground and near what appeared to be a small abandoned house. The trees had signs that said, “No Trespassing—Dairy Hill Hunt Club, Saxe, Virginia.” No available information connects the Hunt Club to MOA. A bio for the imam said he was the chairman of the Council of Islamic Schools in North America, a branch of the Islamic Society of North America. The U.S. Justice Department labeled that group an unindicted co-conspirator in a terrorism-financing trial and identified it as an entity of the Muslim Brotherhood. Junaid, Nafisah Unn. “United Muslim Christian Forum Celebrates Milad-un Nabi 2011,” Islamic Post, May 25, 2011. Smith, Dr. Jemille. “Medical Breakthrough: Extraordinary Discovery of Swine Flu Cure Via El Gilani Methodology,” Islamic Post, December 1, 2009. Home page, American Muslim Ladies Club—Ahmadabad West, Virginia Chapter website, http://amlcva.blogspot.com/. Colorado Department of Corrections memo dated March 19, 2001. Evidence from the trial of Vincente Rafael Pierre and Traci Upshur. Testimony from the trial of Vincente Rafael Pierre and Traci Upshur. Weber, Christian. (2002). Examine Gunman’s Possible Ties to Ul Fuqra. Defense Watch. Documents from the Naval Criminal Investigative Service investigation from 2003-2004. The former member of Fuqra/MOA briefly had a blog in 2006 and is considered to be a credible source. Al-Islam in America: Tragedy and Triumph. (1999). Muslims of the Americas, Inc. and the International Quranic Open University. Court Record. The statement was made by Thomas Gallager during the trial of Vincente Rafael Pierre and Traci Upshur. “2009 Virginia Terrorism Threat Assessment,” Commonwealth of Virginia Department of State Police, Virginia Fusion Center, March 2009. Law enforcement sensitive. Mauro, Ryan. “Confronting Muslims of the Americas,” FrontPage Magazine, July 27, 2011. “A Community Bound by Faith or Jihadists?” (2013). WUSA9 News. Reposted at “Return to Red House,” Gates of Vienna. “Counterfeit Ring Broken Up,” The Politics of CP, March 12, 2007.